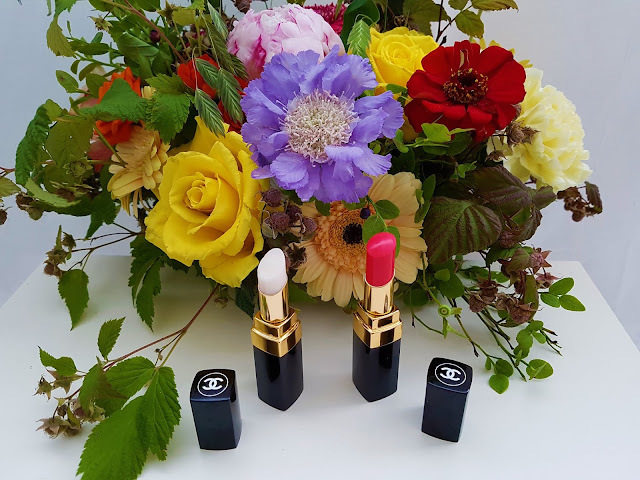 Although, in recent years, I've been fond of impressionable and intense colors of lipsticks in pink and coral shades or statement nuances which emphasizes the lips and attracts the attention, all that has changed this summer. 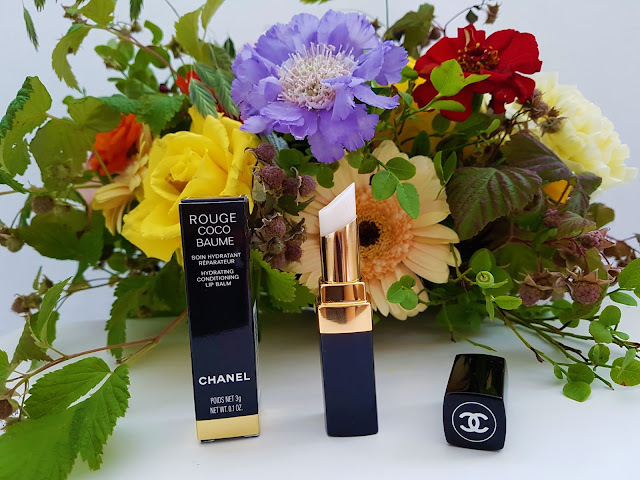 While I was choosing colors for the summer my eyes were concentrated on more gentle and neutral hues and among them I perceived a perfect one - Chanel Rouge Coco Shine Hydrating Colour Lipshine 142 - Rose Émotif. 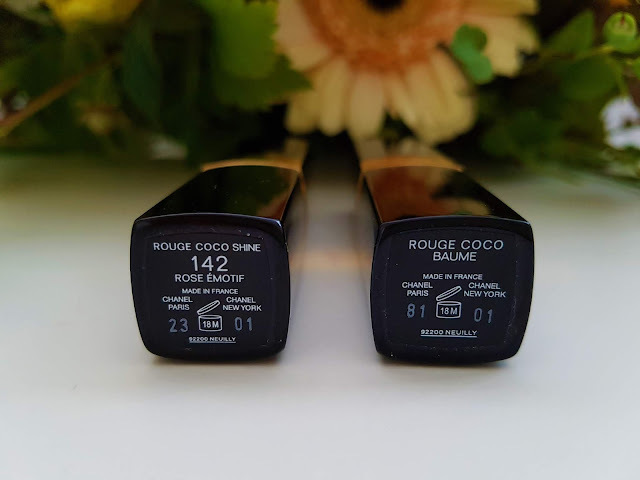 A new shade of this lipstick came out in spring of 2018. as part of Rouge Coco Shine line, under the slogan: freedom, creativity, personality. It's a line that encourages spontaneity and writes its own rules, inviting to express and invent yourself, to tell your story, now, always, again and again, a beauty game with only one rule: be daring! 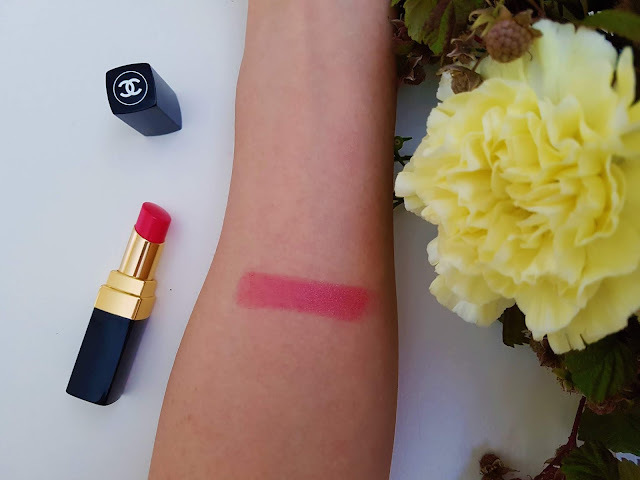 This particular nuance, which I would describe as uniquely coral-pink with warm undertone and ideal for sunny summer days, unmistakably encompasses that motto. 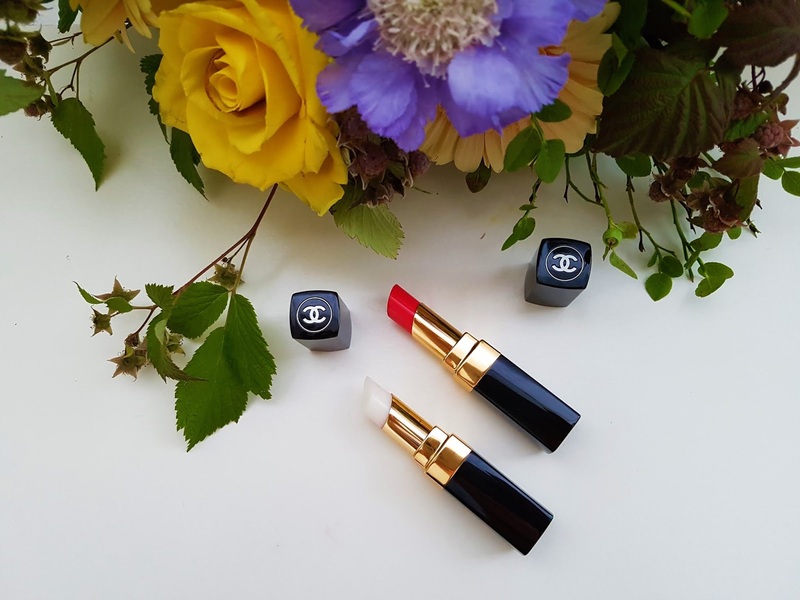 Aside from beautiful shade the lipstick, with its melting balm texture that turns into fluid as soon as it touches the lips, is just made for summer. It's enriched with „hydratender“ complex composed of natural esters that instantly moisturizes the lips, meadowfoam oil derivate for maintaining 8-hour hydration and phytoceramids that protects and smoothens the lips by imitating skin's ceramids. The combination of waxes and phytosterols of botanical origin produces aqueous makeup effect of high gloss in dazzling color palette, from semi-sheer to intensive. I've noticed that lipstick, if applied in one layer, providing a subtle and delicate tint which can always be enhanced by one more, also serves successfully as a hydrating balm that nourishes the lips. 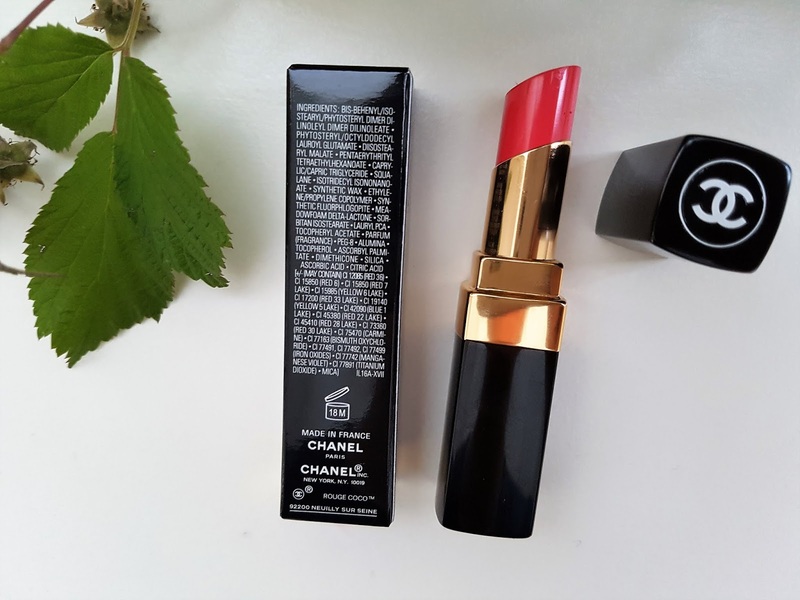 I would compare it to Giorgio Armani Ecstasy Shine Lipstick (you can read the review here), with a difference that I feel that Coco Shine generates more moisture. Furthermore, it's completely fragrance free so is suitable for anyone who doesn't prefer aromatized lipsticks. 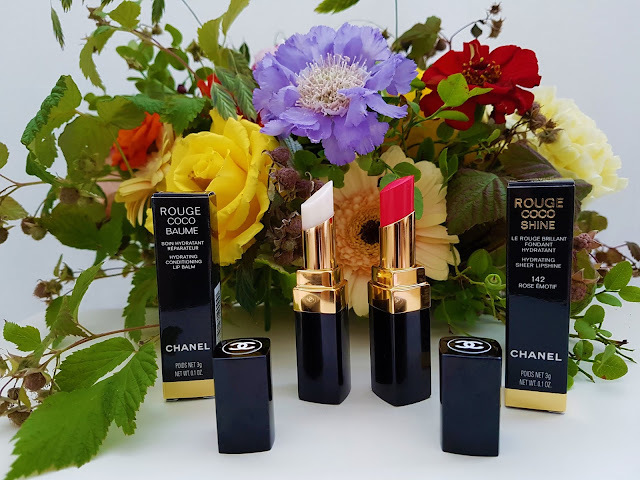 It comes in lightweight, shiny Rouge Coco version, and 3 grams of product is contained in practical, travel-friendly metal tube in recognizable black and gold color. I am delighted with the texture which during application melts away and at the same time colors and hydrates the lips. Beside that, nuance can be upgraded with additional layers which endows the lips with steady, multi-hour radiance. 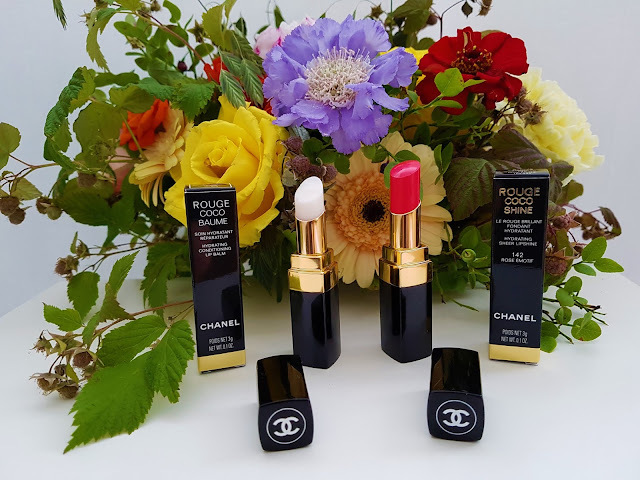 You don't have to worry about dryed or wrinkled lips because I often wore it all day long and after removal my lips were nourished, soft and hydrated, as well as when I employed Rouge Coco Baume Hydrating Conditioning Lip Balm, another outstanding product of house Chanel. Rouge Coco Baume is a luxurious, hydrating balm with a soft, extremely pleasant texture that momentarily melts and ensures brilliant, all-day luster. It's easily utilized, it shields, nurses and moistens the lips and can be laid as substrate for, for example, matte lipsticks. Regular usage results in long-lasting effect and it seems that the lips retain natural moisture. 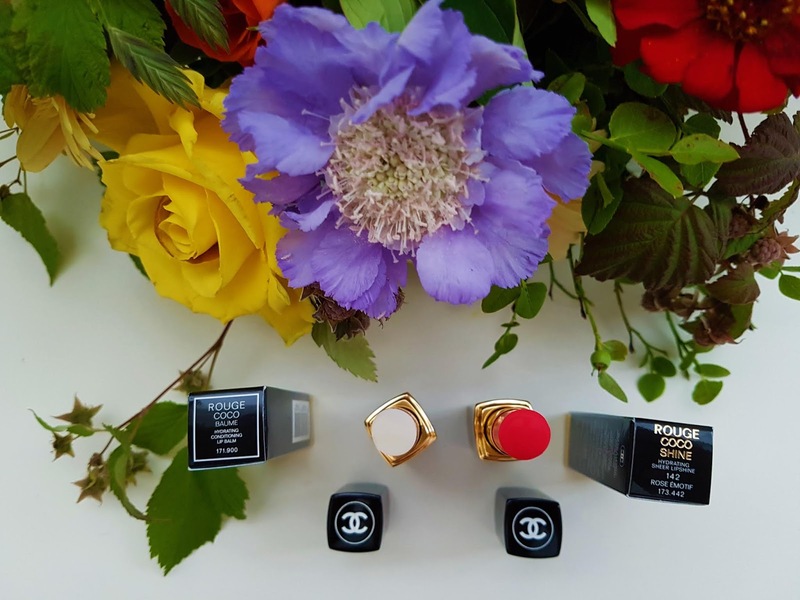 The packaging is identical to that of lipstick, I must admit, in regard to balms, one of the most exclusive in the world: a black casing with golden rim and Chanel logo on top that hides 3 grams of scentless product. Have you tried Chanel Coco Baume or Rouge Coco Shine and in what shade? What are your impressions? Write me in the comments. I haven't tried this. I'm always so interested in new products, so I'll put this on my list! I'm also interested in new products and love try something new. If you try it let me know your impressions, because I'm very satisfied with both products! Thank you so much for your kind words! It means a lot to me. Yes, color is bright and pretty, I really love it! If you try it, let me know your impressions! Love the red one. But the get-up is gorgeous. I'm glad because you love the red one! It is one of my favorite summer lipstick! Thank you so much, dear! You words mean a lot to me! Thank you so much! I also love that color, because it is perfect for summer! 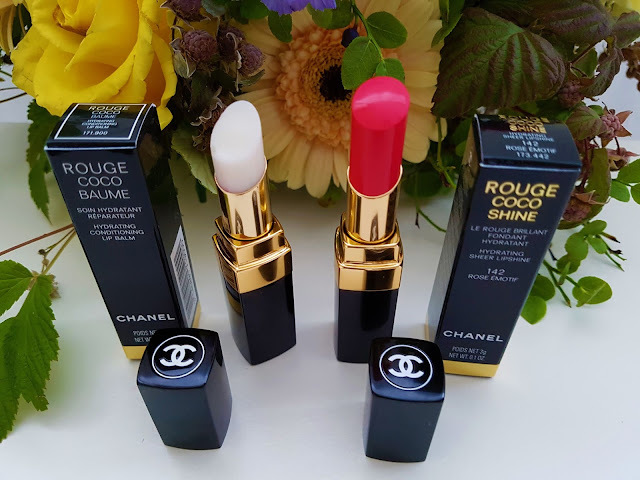 I completely agree with you about Chanel and Rouge Shine. The texture and colors are amazing! I love the photos! The are very pretty. Thanks you so much! I'm glad because you love the photos! Thank you so much, both products look nice and they are really awesome. I completely agree with you. I choose this color like perfect one for the summer. Red lipstick is so beautiful. Yes it is, lipstick have beautiful color and texture. I'm glad because we share the same opinion about these lipsticks! Yes, they are gorgeous products! This brand is a luxury brand, both red and the hidrating lipstick I think it works miracles on our lips !! I completely agree with you. These products are awesome and perfectly "work" theirs job. I am totally in love with that shade and I want to try the lip balm! I'm glad to hear that you love this shade so much. It is really amazing. If you try it, let me know your impressions. Oo I didn't know about the lip balm! It sounds amazing! 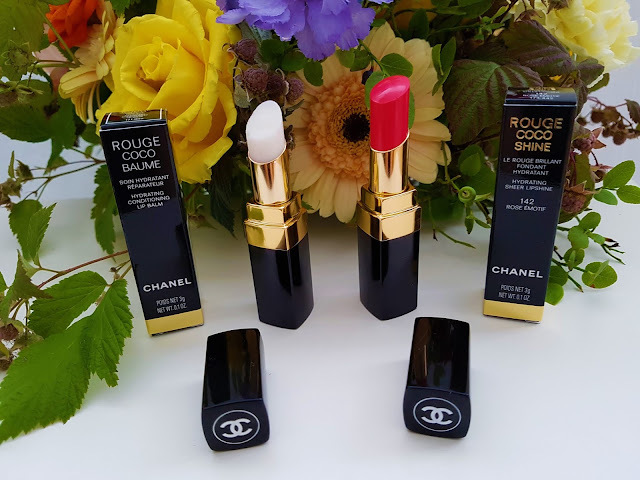 Yes Chanel have and lip balm and it is awesome. Lips are so hydrate, soft and beautiful after using this product. I use it a few months and I really love it. We share the same love! I also love Chanel. It is one of my favorite brands! Hvala ti puno, draga! Drago mi je čuti da ti se dopadaju fotografije. U pravu si i ruž i balzam su jako kvalitetni i jako često ih nosim na usnama. I'm really curious about the natural balm lipstick; such a brilliant and luxurious beauty product. I'll look into it, for sure! Have a fabulous week! 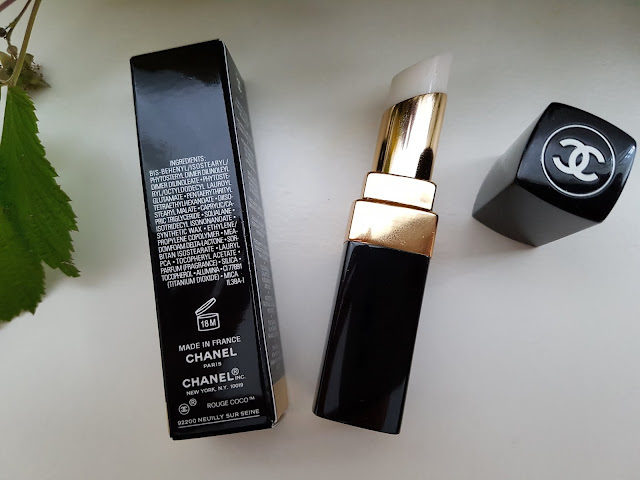 Chanel Baume is amazing product and I highly recommend to you to try it. When you try it let me know your impressions! It would mean a lot for you to follow my blog by clicking on the blue follow button found on the right hand side of my blog! I would like follow you after I get notification that you follow my blog. Thank you! I will go and follow your blog now! How do I do this as when I enter my email in the subscribe box it doesn't work? Dear Cocoa&Chats thanks for information that my subscribe box don't work. Now I remove that option and I start follow your blog! I'm glad to hear that you are Chanel lover like I am. Have a nice day! What a pretty shade of red! Yes, you are completely right. The shade is gorgeous! You are welcome! Dress is very beautiful! Yes, Chanel have awesome lipsticks and such a huge range of color where every girl or woman can find something for yourself. I love how RICH these lipsticks are! They look very bold and do the job really well. I love the color options! I am glad that you love these lipsticks! They are gorgeous, they have a beautiful formula for moisturizing lips and huge range of colors! This looks like a lovely shade. Thanks for sharing the review. You are welcome. I am glad you like it, because shade is very lovely and beautiful! I'm glad to hear that you love this shade! I can agree with you. Shade is gorgeous and perfect for summer! Yes shade is awesome and looks very nice on the lips! Yes I am always ready for support others bloggers so I just start follow your blog! When you try it let me know your impressions! I am curious do you like it as much as I do! cant go wrong with some chanel! I completely agree with you! Chanel is the best! I haven't tried either of these, but that red shade looks beautiful! I love that it's moisturizing since matte lip products aren't always the best for summer. We share the same opinion about matte lipsticks during summer time. I skip them and use only those which can moisturizing lips. Red lipsticks is always one of my favorites to wear. And mine also, but I don't prefer red lipstick during summer. I like more pink or coral shades, while during winter time I always wear red. Yes, the lipstick and lip balm are awesome. I really love them! The red of the lipstick is perfect! Yes I completely agree with you, the shade is awesome. Lipstick and lip balm are amazing and I can't decide which one is my favorite! I still didn't try matte lipsticks from Chanel but I plan to buy some for autumn. I love de red color. I'm glad that you like this color! Have a nice night! 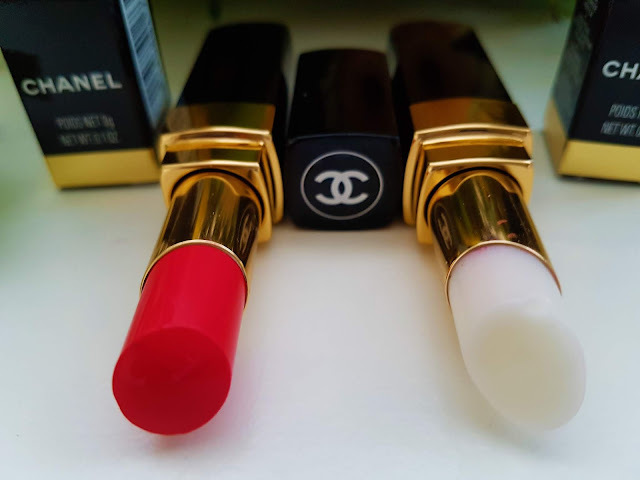 I love Chanel's beauty line. The quality is just so good plus the packaging is everything! I completely agree with you. Chanel is the best and they think about everything - formulas for great products and gorgeous packaging! I'm glad to hear that you also Chanel lover like I am. Yes, they are great! I really love them! 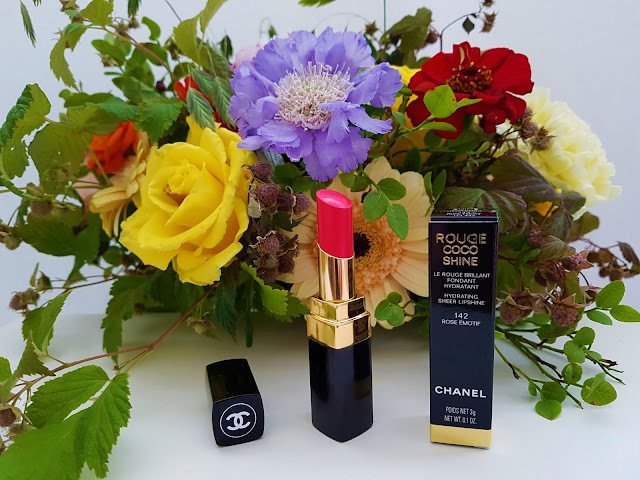 Great review of the Chanel Rouge Coco Baume. It seems like it is moisturizing and the color is so cute. Thank you so much! I'm glad to hear that you like review. Rouge Coco Baume is awesome and I really like this product! I'm glad to hear that we share the same opinion about this Rouge Coco color. I'm glad to hear that you like these Chanel lip balm and lipstick. They are awesome.